Looking for an affordable alternative to shared / coworking spaces? 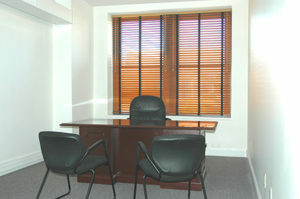 Bassett Associates can find the perfect office space to meet your needs. Bassett Associates can provide entrepreneurs the ideal location to operate their business at an affordable price. From a single small work space to multiple office workspaces, Basset Associates finds unique solutions to help assure your success. Beth Welsh is a creative thinker who finds personalized solutions to make your business thrive. Explore current availabilities by filling out the contact form. Beth will get back to you as soon as possible with available options or possibilities coming on stream in the near future. She can find you a space at an affordable price or custom design a property to fit your needs. In a hurry to make an informed decision? Call Beth and seek advice on plans and space needs.